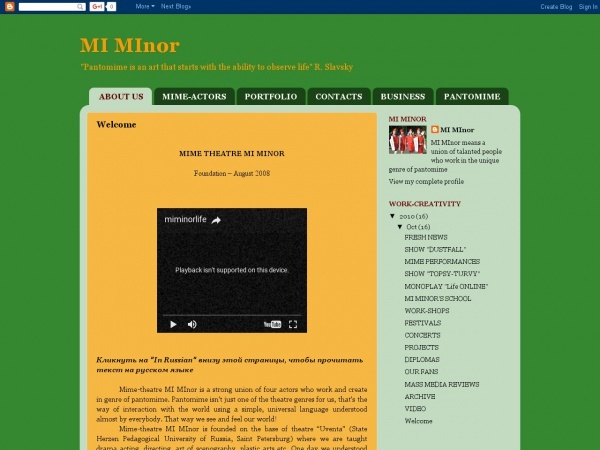 “MI MInor (since 2008) is a union of actors who work and create their unique theatre pieces with the use of a synthesis of pantomime, clownery and drama. MI MInor is a constant participant of festivals and concerts in Saint-Petersburg, winner of the International Mime Festival The White Mask (Moscow, Russia). A participant of the 30th Mime Festival in Dresden, Germany. There are 3 full-time plays in the repertoire of the theatre, moreover, plenty of sketches and numbers on different topics and occasions.